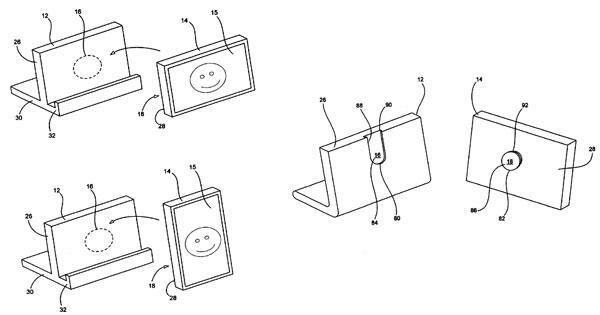 Apple Inc. is attempting to develop a revolutionary dock connector for handheld consumer electronics gadgets that will allow the devices to be docked in any orientation and, in some cases, charged wirelessly. 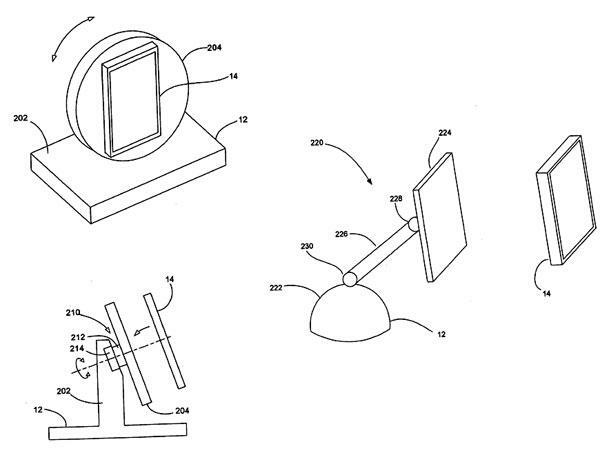 In a patent filing covering docking apparatuses published by the United States Patent and Trademark Office on Thursday, the Cupertino-based iPod maker lays out several new methods for contact-based docking methods that employ electrical contacts to transfer data and/or power between a handheld device and a docking station that lay in contact with each other. Of greater interest, however, is the company's discussion of "non-contact based platforms" such as inductive devices, optical devices, or wireless devices that are capable of transferring data and/or power without mating contact. "When electrical contacts are used, the electrical contacts may be implemented in connectors and/or they may be surface or flush mounted on the housings of the portable electronic device and the docking station," Apple said of traditional docking methods. "In either case, each device includes a set of corresponding contacts that when in contact allow data and power to be transferred therethrough." On the other hand, non-contact platforms, such as inductive coils, can be placed in each device to transfer both power and data. "The inductive coils are typically hidden from view behind the housings of each device and therefore they are more aesthetically pleasing than electrical contacts, which need to be exposed in order to operate effectively," the company said. "Furthermore, inductively based systems are more robust than electrical contacts. For example, there are no contacts to wear out and/or oxidize." According to the filing, a docking station in inductive based systems includes the primary coil while the portable electronic device includes the secondary coil. Both the docking station and the portable electronic device would also include their own transceiver that both transmits and receives data. "In one implementation, both data and power are transferred via the inductance-based system. For example, low frequency electrical current may be passed from the primary coil to the secondary coil in order to power or charge the portable electronic device and high frequency current may be passed from one coil to the other in order to send/receive data," Apple said. "The data and power inductors may be separate, integral or they may be superimposed on one another. In another implementation, power is transferred via an inductance-based system and data is transferred via a wireless system. The combination of inductance and wireless provides an efficient way to transfer both power and data while keeping both the docking station and portable electronic device fully enclosed." Another part of the invention calls for interface mechanisms to be configured to communicate with one another in whatever position the portable electronic device is oriented in relative to the docking station. "That is, the orientation of the portable computing device is irrelevant to ensure communications between the portable computing device and the docking station," the iPod maker explained. "The interface mechanisms and operatively couple with one another when the portable computing device rests on the platform regardless of the orientation of the portable computing device." For example, Apple added, the interface mechanisms are capable of interfacing with one another if the device is placed at various orientations between 0 and 360 degrees, more particularly at 0/360, 90, 180 or 270 degrees, and even more particularly at 0/360 and 90 degrees relative to the platform. "In essence, the interface mechanisms are rotationally symmetric so that regardless of the orientation of the portable electronic device relative to the docking station the coupling therebetween still works correctly," the company said. The August 9, 2005 filing is credited to Apple employees Steve Hotelling and Gus Pabon.